Our two days in Derbyshire at the end of March encompassed medieval and 20th century history with visits to Hardwick Hall (National Trust) and the Tramway Museum at Crich. For years I had wanted to visit Hardwick Hall – the great house created by Bess of Hardwick (Elizabeth Talbot, Countess of Shrewsbury c 1527 – 1608)) – near Chesterfield and my expectations were more than fulfilled. I was captivated by the magnificent Tudor tapestries, furniture and plasterwork – so much so that we didn’t have time for a tour of the gardens. So we will have to go back sometime! Bess emblazoned her initials (ES) on the rolling countryside around the hall which was built between 1590 and 1597. She certainly left her mark on the landscape and on architecture in England – probably more than her good friend, Elizabeth I, did. The Queen didn’t build anything new – she just made do with what she had inherited from her father. But Bess of Hardwick’s majestic pile with its regal balustrades and her initials was built to make a commanding, powerful statement over the surrounding countryside. In the days when glass was a very expensive status symbol the sight of all those large windows at the Hall twinkling in the sun must have been awe-inspiring. Bess survived some financially crippling episodes in her life and four marriages to become not only the second richest woman in England (the first, of course, being Good Queen Bess herself) but also to create an aristocratic dynasty (the Dukes of Devonshire). She employed an architect, Robert Smythson, who was inspired by the symmetry of the Renaissance style of architecture, to design Hardwick Hall even before the makeover of the Old Hall next door was complete. Glimpses of Tudor plasterwork lured us into the decaying shell of the Old Hall. Those remnants of the hall’s glory days had been washed white by centuries of rain. The National Trust has made it possible to reach the third floor and see the plaster figures on the over mantel which gained her great chamber the nickname “Giant’s Chamber”. Were those Roman warriors Mars and Hercules? No-one knows but it is obvious in Hardwick Hall that Bess drew a lot of inspiration from Greek and Roman mythology. And it is also obvious that by the time that was built that she wanted to portray the importance of women even in societies like hers where they suffered considerable financial and social disadvantages. Her rich tapestries often depict women, some maybe not as virtuous as might have been expected. One leaflet provided by the National Trust entitled Fifteen shades of Bluey-Grey, suggests that some might be of brothel scenes. And some of the plasterwork scenes show women as warriors and minstrels. She also made sure that Queen Bess was honoured in the artwork and textiles in the hall. Her home was sumptuous and beautiful – fit for a Queen, in fact, but Elizabeth I never did visit. After several hours we felt surfeited and it was time to head for the Great Barn restaurant for some physical sustenance. It was packed for so many had come to enjoy a day out in such a lovely place. The National Trust has certainly made this a very family-friendly venue, right down to leaving a trail of furry reindeer toys for children to spot. 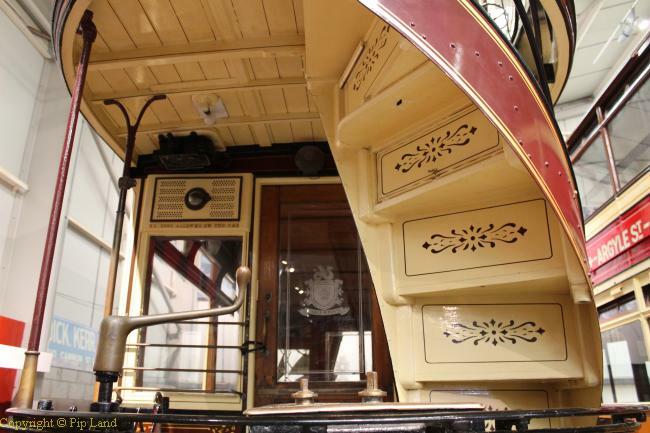 The following day we had an equally fascinating time at the National Tramway Museum. We were impressed by the warm, friendly atmosphere created by the volunteers. They obviously enjoyed being part of such an exciting, memorable museum and shared that with the visitors. We began with a ride on an open top Glasgow tram dating back to 1919 and finished on a much “posher” Leeds one (see below). In between we enjoyed a very informative tour and in the Exhibition Hall David relived his memories of trams in Sheffield in the 1950s. 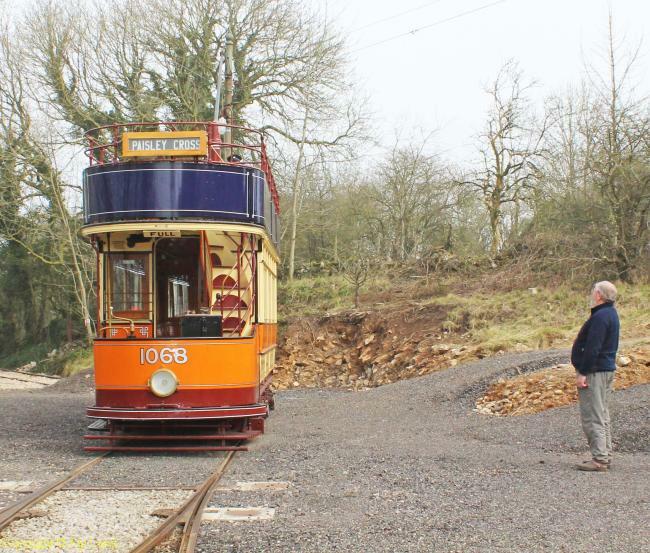 David appreciated how the museum volunteers had so sympathetically restored and finished the trams to a very high standard. 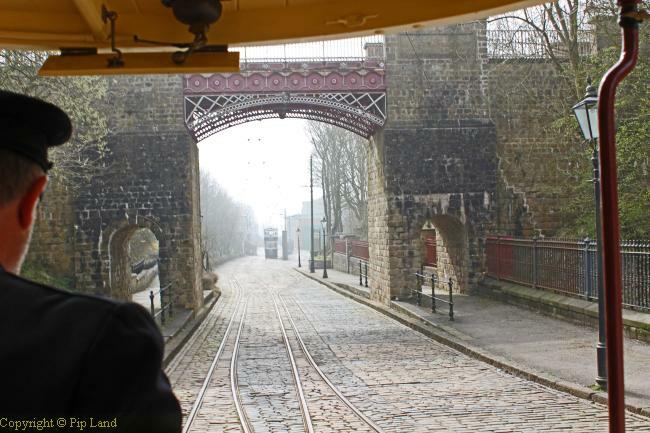 Before I visited Crich I had never travelled on a tram in Britain! But I had been on the oldest electric tramway in Asia – in Kolkata, India. 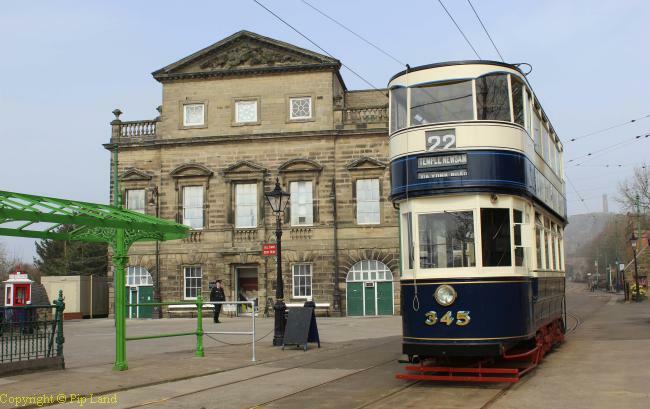 For more information see: Hardwick Hall and The National Tramway Museum.